Jose Palacios was born in San Juan, Argentina on 25 October 1923. In 1944 he emigrated to Cordoba with his family as a result of an earthquake in the province of Cuyo. He worked with his father and brothers, but later moved to Buenos Aires for work. He was one of the early pioneers of the JOC in Córdoba, where he worked closely with Fr Enrique Angelelli, later bishop of La Rioja. He was elected national president in 1952 and was also a fulltime worker for the movement for several years. In 1954, he took part in the YCW International Bureau meeting in Rome. His wife Amalia Castaño de Palacio was also a JOCF leader and fulltime worker for the movement during this period. Both of them participated in the International Pilgrimage to Rome in 1957. Jose and Amalia later had three sons. In 1958, Jose Palacio also took part in a conference of the World Assembly of Youth (WAY) held in New Delhi. The same year, having completed his work with the JOC, he took up a post as director of a trade union training centre in Buenos Aires. Meanwhile, he was also active in the Movimiento Obrero de Acción Católica (MOAC), the Christian Workers movement of Argentina, for which he later became a member of the Latin American Secretariat of the World Movement of Christian Workers (WMCW). As a result of his experience with the JOC, the WMCW and the trade union movement, Jose was chosen to become the first lay collaborator for the International YCW. Sadly, he was never able to take up this post. 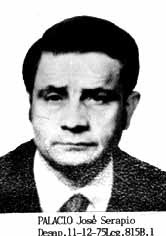 On 11 December 1975; Jose Palacio was abucted from outside his office. Many years later it was discovered that he had been tortured and killed by gunshot on 13 December 1975. According to some sources, his disappearance was the work of the "Tres A" (Alianza Anticomunista Argentina). Another hypothesis is that his disappearance was linked to Operation Condor, the CIA-linked assassination program that operated in the Southern Cone countries of South America during the 1970s and 1980s.